I am excited to have partnered up with the Santa Hustle Daytona Beach and will be doing a post-race recap with plenty of photos from the event. The Santa Hustle has given me one 5K entry to give away to one of my lucky readers! This festive race will be taking place in two weeks, on Sunday December 9th. Santa Hustle offers both a 5K and a Half Marathon. Since I love Christmas and was born/raised in Daytona Beach, I decided to make this race my first official Half Marathon! Both the 13.1 and 5K will go up and down the World’s Most Famous Beach and plenty of people will be dressed like the Jolly old man. 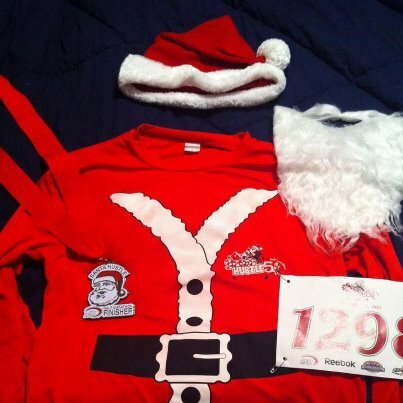 All participants will receive a free Santa Beard and Santa hat to wear while running. Participants will also receive a customized Santa Claus long sleeve Dri Fit shirts. The Santa Hustle will give awards for the best group Santa Costumes and best individual dressed Santa Costumes. You know how much I love dressing up! My best friend and I have been planning our Santa costumes for quite sometime! Along with the costume contests, Santa Hustle will be giving personalized medals for the first, second and third placed male and female in each age division. During the race, we will stop by candy stations, get cocoa, eat cookies and be entertained. The Santa Hustle after party will be in the Grand Ballroom located in the Ocean Center. We will enjoy Christmas Music, ab appearance by Santa Claus, Live Reindeer and Horse Drawn Sleigh. Check out photos from previous Santa Hustles here. Like Santa Hustle on Facebook to keep up with their events throughout the year. Come experience this race day with me! Enter below for your chance to win a free 5K entry. Let me know which holiday songs should I put on my playlist! !